As a large coronal hole on the Sun moves away from facing the Earth another large one is turning to face us, therefore we could be in for more large quakes in the coming days. This is a "coronal hole" (CH)--a region in the sun's atmosphere where the magnetic field opens up and allows solar wind to escape to escape. 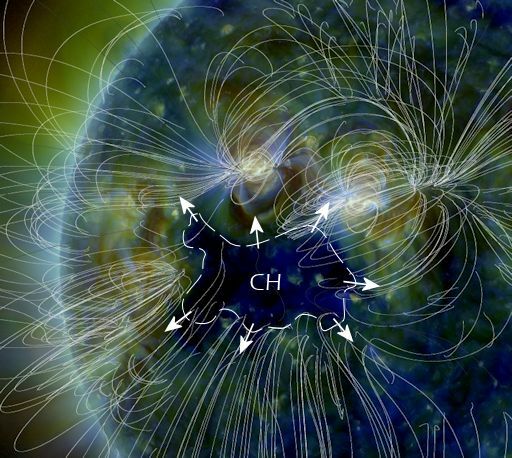 A gaseous stream emerging from this coronal hole should reach Earth on or about Jan. 27th. 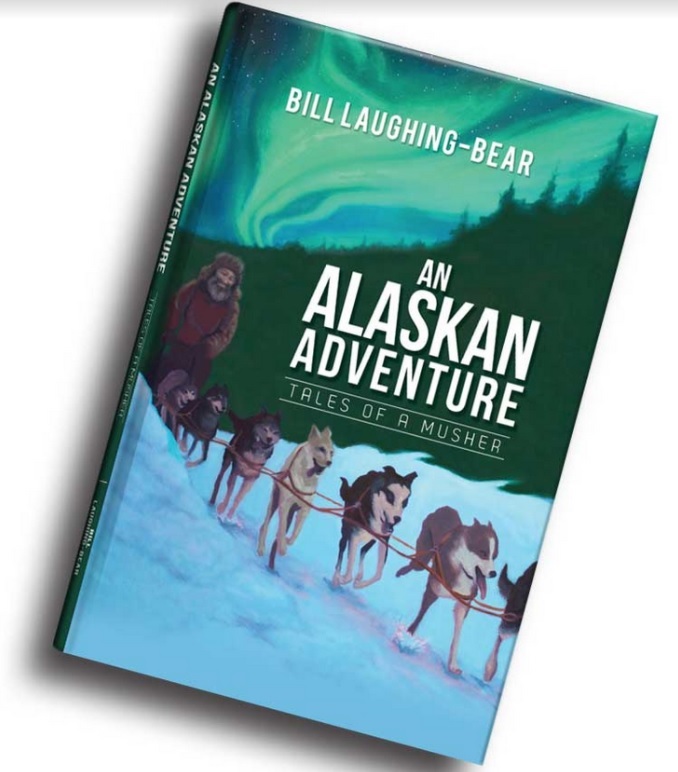 Arctic sky watchers, mark your calendars. Auroras are in the offing later this week. According to Ben Davidson of quakewatch.net, the occurrence of geomagnetic storms appears to have a depressive effect on earthquakes during the peak of the storms. 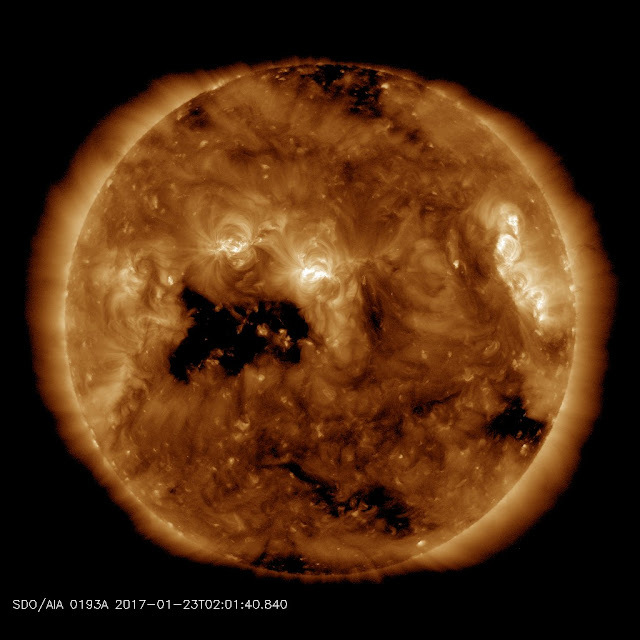 Often the primary risk window begins when a coronal hole begins facing earth, and ends when geomagnetic storms occur, or when the coronal hole leaves the earth-facing half of the sun. The sun is not 93 million miles away and the earth does not orbit the sun. The sun is a light, created by God, that circles the (flat) earth overhead. There is no truth to this article. Wake up! Research FLAT EARTH and learn the truth that is being hidden from you. Even the ancient Book of Enoch describes all the orbits and heavens. How is the climate on your planet, anon? The Book of Enoch decribes the PATHS of the sun, moon and stars... not orbits. Don't be lazy... do your due diligence and RESEARCH!!! If the earth is flat then why are all the planets, moons and stars all round... I see it with my own eyes... When I flew countless times on a passenger jet I saw the horizon curve around in a matter which proves the earth is round... I suggest a little less weed and perhaps more oxygen intake..
Sir, I would ask you... if the earth was flat and all that was created was contained within the firmament (as described in Genesis), then would you not see the moon and stars all around? The so-called planets are wandering stars. What are stars? Not burning balls of hydrogen or nuclear reactions... stars are luminaries... LIGHTS... each having been created, named and placed WITHIN the firmament by our Creator. Each luminary has it's own glory... each one is different. If the sun and moon are lights (again in Genesis), then understand what science has named "planets" are in reality LUMINARIES... Lights. I do not smoke "weed" as you suggest and my oxygen intake is just fine. Do your due diligence and research. Prove to yourself whether the earth is spherical or on a (flat) plane, with a firmament (dome). It's all in the Bible but sadly folks today either think they know everything there is to know or simply too lazy to do the research. They rely on science which is oppossed to God. Science in general and cosmology seek to hide God's creation. Lucifer's deception has the whole of the earth captive... people blindly believe the lies that science propagates as truth because it comes from "experts". There are many vids on youtube for the curious. Besides, if the world was flat, how does the sun keep going from right to left and then return on the right again? Lol!!! Nut jobs! It circles above the (flat) earth. You are not the first to ridicule and certainly not the last. Everyone who does the research comes to the same conclusion... the earth is flat, on a plane. Your folly is you think you know all... by your reasoning you can't understand how the sun could move from right to left and then return on the right again... any yet the answer was so simple. Yes! The Flat Earth Brigade!! I used to look at what they were presenting in various forums and comment sections... I thought "What is wrong with these people?". LOL! Fast forward about a year, when I finally took the time to research what they were presenting and guess what? They are absolutely right!! The earth that God created is flat and covered by a firmament. The sun is very near and very small. The moon is also very near, as are the luminaries or stars. It is Yahwehw's Terrarium and everything He created is contained within the bounds of the firmament. I don't know what that picture is you have presented as our sun... is that CGI? It bears no resemblance to our sun... our sun is constant source of LIGHT, beneficial and neccessary for LIFE! It operates as God intended. I wouldn't want to be a scientist when people find out the truth of God's creation. I'm afraid there will be "hell" to pay. The Book of Isaiah describes the "circle of the earth", denoting a flat plane, not an orb. A circle in scripture is no different than a circle in geometry... a circle is as one would draw with a compass, not a ball or spherical object. Gary, I supposed I missed the fact that the sun rotates? Never considered it before I found your site. And, are these holes common? Cyclical? New? How do they figure in the larger picture of earth chaos besides quakes? Love your site, btw. Have an organic farm in N GA USA and have noted changes in sun just since 2008. Whether the earth is flat or not all of you guys still suffer from pain, hungry, disease, thirst, insult, blame, etc.